As The Iraq War Ends, Reassessing The U.S. Surge When 30,000 additional U.S. troops entered Iraq in 2007, the tide of the war turned. The surge was widely credited — but was it the only cause, or even the main one? Some argue that Iraq's Sunnis had already decided to work with the U.S. rather than fight against it, and that this changed the course of the war. In 2008, for example, Sen. Lindsey Graham spoke at the Republican National Convention about the U.S. presence in Iraq, saying that, "by every measure, the surge of troops into Iraq has worked." And in a 2007 speech to Congress on the situation in Iraq, Gen. David Petraeus said, "The military objectives of the surge are, in large measure, being met." But Doug Ollivant, who was an Army planning officer in Baghdad, took part in putting the surge troops on the street. And he disagrees with the idea that the surge fixed things. "The surge really didn't work, per se," Ollivant says. Ollivant is now with a Washington think tank, the New America Foundation. He says what happened had less to do with the Americans and more to do with deep political and social forces inside Iraq. "I think it was the Iraqis who essentially figured out their problems [and] used the Americans who were there to help them formulate that solution," he says. "Fundamentally, it was the Iraqis trying to find a solution, and they did." Sunnis Allied With The U.S. According to Ollivant, Iraq's Sunni leadership realized it was losing a civil war to Iraq's much larger Shiite population. The Shiites were running the government, and Shiite militias were wiping out entire Sunni neighborhoods and refugee camps. "So there was probably a very early signal to the Sunni leadership that this was not going well," he says. He argues that the Iraqi Sunnis — who had been at war with the U.S. — decided to work with the Americans. And here's the key thing, according to Ollivant: They came to that conclusion before the surge. So Sunni leaders broke with their ally — al-Qaida — and helped the Americans target the terrorist group. In Ollivant's view, the Sunni thinking went something like this: "The Americans then become our best friends because we've allied with them against al-Qaida, which is nominally the whole reason they're here in the first place. They can help us cut a deal with the central Shiite government and get us the best deal out of this we can." 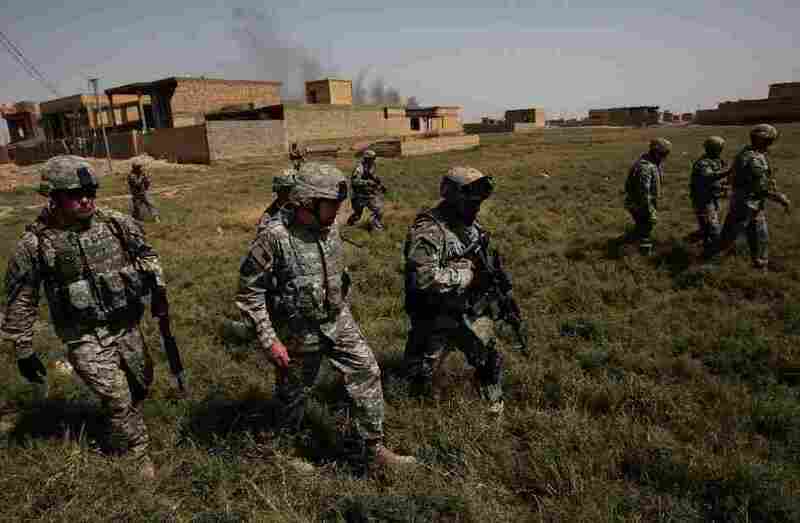 The American troop surge helped, Ollivant says, but the real change came from inside Iraq. But others disagree. Kim Kagan, author of a book called The Surge: A Military History, says Ollivant underestimates the role of American troops. "What Doug Ollivant's argument is putting forth is actually too simplistic a version," says Kagan. "It does not look at the important dynamic between military change and increase in security." Kagan made many trips to Iraq at the height of the surge. Ollivant has it backward, she says. It was the larger American military presence that convinced Sunnis to work with the Americans. "This is the fundamental dynamic of a counterinsurgency campaign: That first came security, and then came a change," she says. So which came first? Did more troops change Iraq, or was Iraq already changing before more troops arrived? 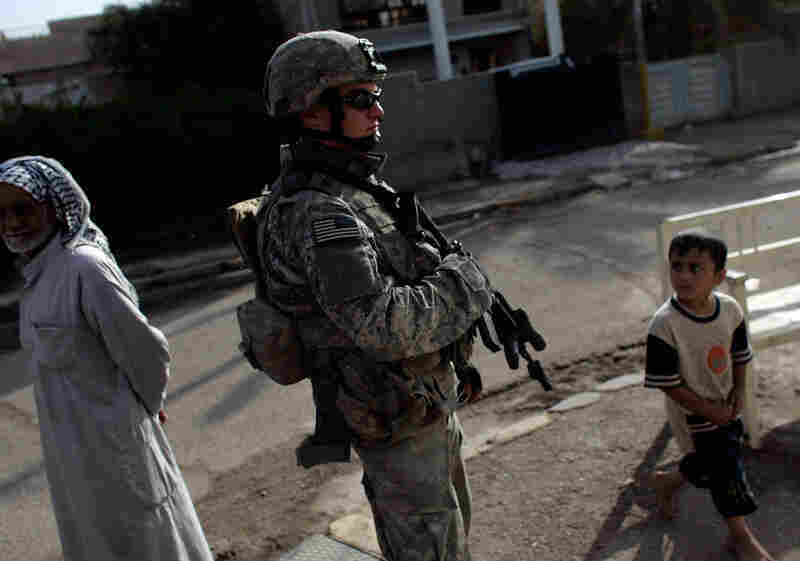 U.S. Army Specialist Zachery King patrols Baghdad in 2007, the year the U.S. military added some 30,000 troops to the battle in Iraq. John Nagl, a retired Army officer who helped write the Army counterinsurgency doctrine that guided the war in Iraq, thinks Kagan has a point about the troops. "The 30,000 additional troops they used in a new way to provide more security inside Baghdad and in the rings around Baghdad clearly played some role," he says. But Nagl says Ollivant is right to highlight the role played by Sunni and Shiite leaders to settle their differences. "I think that mix coming together all contributed to a much more favorable outcome than we had any reason to expect," he says. For Nagl, the bottom line is that a number of factors were at play, and it's hard to tell which was the most important. "This is going to be a question that social scientists ponder for the next century," Nagl says. Ollivant says it's important to learn the lessons of the Iraq surge now that there's another surge, this time in Afghanistan. Ollivant served as an adviser last year to senior U.S. officers in Afghanistan. And he says — just like in Iraq — those American troops can only do so much to end the violence. In the end, he says, it's about the locals: Afghans are going to have to work out their differences if they want peace.